Join people around the world this Saturday, January 28th, 1 p.m. Eastern time, to carry the prayer from Standing Rock to the steps of banks around the world who are funding harmful Oil Extraction. If you’ve been reading news about President Trump’s Executive Actions this week, you know that prayers are needed to help the protestors at Standing Rock. On Tuesday, he signed executive orders that took the first steps toward reversing Obama’s rulings against oil pipeline projects. One of those rulings, from the Army Corps of Engineers, told owners of the pipeline to come up with alternative routes that would not endanger the water supply of the Standing Rock Sioux tribe in North Dakota. Now, the Army Corps of Engineers is being ordered to “review and approve in an expedited manner” the North Dakota pipeline plan of Texas-based Energy Transfer Partners. Unite in Global Prayer Action to elevate the consciousness of the financial institutions and governments, asking that they make the choice to invest in clean renewable energy, the future of our planet, and the protection and rights of all people. Do you get discouraged if your prayers aren’t immediately answered? The problem may be that we are praying for God or a higher being to do something which it is not in its nature to do… take direct action vs. inspire and guide us to make the right choices. In prayer we are trying to do something or to get something done, either for ourselves or for someone else. We pray to get an effect, and since an effect is involved, energy has to be involved, and all prayer involves the transmission of energy, [in this case toward the people and situation at Standing Rock]. In the prayer form known as the Lord’s Prayer that is found in the Christian Bible, Jesus states that we should ask for energy (“our daily bread”), cleansing (forgiveness), and guidance. A little further on in the chapter of Luke (11), Jesus makes the famous statement about, “Ask, and it shall be given unto you….” This has been taken to mean that you can ask God for anything you like and you will get it, although in practice it obviously doesn’t work out that way. The reason is revealed only a few lines further. What is to be given is the Holy Spirit. In other words, energy, ideas, and inspiration. We find this same idea in the Old Testament, in Sufi, Hindu, and Chinese writings, as well as in Hawaiian – namely that what we receive from above is the wisdom and the power to act. But it is we who must do the acting. This brings us to the point of fact that there are essentially two types of prayer: vertical and horizontal. By vertical prayer, I mean that which is directed toward God or the Higher Self or toward someone in spirit. From this type of prayer we can only get inspiration, knowledge, understanding, and energy. Note carefully that the guidance we may get is in the form of ideas and inspiration. We do not actually get the kind of guidance that tells us exactly what to do and how to do it. That kind of guidance implies the making of choices, and that is our sole prerogative. Horizontal prayer is that directed toward our everyday life, either to heal or help ourselves or others, or to change the future. This type of prayer is accomplished by us, and its effectiveness is determined by our beliefs and by the amount of energy we put into it. We each create our own experience of reality, the circumstances we find ourselves in, and through prayer properly understood we can change those circumstances. But it is the individual who changes the circumstances, not God and not the High Self. From them we only get the tools; they will not do the work for us. Please join in The Global Prayer Action for Standing Rock so that all involved get the guidance to resolve the situation in a peaceful, environmentally-conscious manner. And please share this and invite your friends to help support the protestors at Standing Rock. If you want to start 2016 with the goal of loving yourself, loving others and loving life, I recommend picking up a copy of Tame Your Inner Critic: Find Peace & Contentment to Live Your Life on Purpose by Della Temple. We all spend too much time in our lives criticizing ourselves, what we’ve done, and what choices we’ve made. I wanted to learn more about how to differentiate between my authentic self and the judgmental voice in my head. All the tools necessary to do that and more are found in Della Temple’s book. This isn’t a quick read – rather, it provides a process of peeling away voices in your head that were placed there by others, and getting in touch with the voice of your own inner guidance, your own intuition, your own higher knowing. As a writer about the chakras, I was very interested in Della’s chapter on “Chakras and Your Life Force,” and her experience with releasing foreign energy from the chakras through a grounding cord or blowing up this unwanted energy in the visualization of a rose. The result of using the many exercises in Tame Your Inner Critic is a feeling of greater peace, and the ability to create your reality following your life’s intention, not the wishes of others. There is also a companion workbook that makes it very easy to follow the recommended exercises. You can use it make notes, or you can use the journal of your choice. 1) As we’re entering into the New Year, can you explain how you re-create your statement of being instead of making resolutions? Most people believe that action is the most important part of creating the world they desire. In forming a New Year’s Resolution most people come from the negative and figure out a way to attack the “problem,” believing that by physically doing something, they will fill the void in their lives. They have it backward; it’s better to think and feel it into being. So, I don’t think in terms of lack or resolutions. Instead, I choose terms more reflective of my feelings and my best qualities. If I think and feel love, kindness, and joy every day, then even if unexpected things happen in the coming year, I will view them through the lens of these top-of-mind conscious thoughts. Everything that is coming to us is a direct result of the vibration of our thoughts, feelings, and internal dialogue. As we think and feel, so it is. Changing our thoughts and feelings really does change our reality. 2) What made you decide to delve into studying psychic healing? My inner critic used to be very loud and annoying. It held me back from doing many of the things I wanted to do. It told me I was too unprepared, too opinionated, and just not good enough. In fact, I had grown so used to the incessant negativity that I believed I was deficient in some way. I had read about the body’s energy system and had a hunch that greater understanding of auras, chakras, and the interplay between thoughts, feelings, and bodily reactions would lead to the peace and contentment I craved. So I enrolled in a beginner’s program at Boulder Psychic Institute. As I did the work, my inner critic stopped nagging me. I wanted to write about my experience to help others find their own inner peace and contentment. 3) How would you say we allow others’ voices to turn into our own inner critics and how do those voices stop us from living a life of purpose and meaning? Thoughts and feelings are energy and through our energetic body (our aura and chakras), we exchange energy with the people in our lives. As an example, when we think of someone, we transmit some of energy from our aura into theirs. When a parent worries about a child, they may be sending a mixture of love, concern, and judgment energy into their child’s aura. A boss or a co-worker may send us a little bit of criticism energy mixed in with their morning hello. These outside energies combine with our internal truths. Soon we are unable to tell one from the other, so we accept it all, as a right, accurate and exact portrayal of who we truly are. This I believe is the genesis of the inner critic. The judgments, criticisms and displeasure we feel about ourselves are energies we’ve unconsciously absorbed from the people in our lives. It’s difficult to live a life full of purpose and meaning – our own purpose and meaning – when we are surrounded by the stories of who others think we should be. 4) How can we tell foreign energy from our own? Foreign energy makes your body feel tight, tense, and uncomfortable. An old Chinese proverb states, “Tension is who you think you should be. Relaxation is who you are.” Our natural state of being is relaxation, joy, and peace. Our body is relaxed because our energy is flowing, not static. The book is full of tools and techniques to keep your energy flowing. One of the most effective tools and a tool that I use in my personal life every single day is called a grounding cord. A grounding cord is an energy cord that connects your body to the center of the earth. It acts like a vacuum cleaner, helping you efficiently release all those thoughts and feelings of insecurity and self-doubt. Attaching your aura, as well as your body, to this grounding cord allows your full energetic system to be connected to the earth. 5) Can you explain how the chakras play a part in manifesting what one wants? Chakras are wheels of energy that connect our physical body to our energetic body. The chakras act as waystations, transmitting information back and forth between one’s body and Spirit. If the chakras are clogged with foreign energy (other people’s thoughts and feelings), then we might be manifesting a life that’s in tune with our neighbor’s idea of the good life, not ours. Using the energy tools described in the book (grounding, blowing up a rose, tapping), you learn to release energies that are not your own, bringing balance and harmony to your energy system. When the chakras work in harmony with each other, they send out strong vibrational signals to the universe. These signals call back to you energies of the same vibrational family. So the trick is to align all seven of your major chakras into a harmonic – a symphony of vibrations resonating with the energy of what you want to manifest. 6) How should one best follow your exercises and meditations when the first step is always to close your eyes? I found your accompanying Workbook helpful in this regard, but is it necessary? One way is to read through the meditations first, and then record and play them back as you sit in meditation. One of my beliefs is that we can heal ourselves; we don’t want to give our power away to others. With that in mind, I think it’s helpful to hear your own voice on the tape as you sit in meditation. But I also know that people need a starting point, so I’ve recorded a few meditations for readers to download free. I believe that taming your inner critic and uncovering your life’s purpose is both a left-brain and a right-brain activity. It’s truly a journey of discovery, a process that takes time and patience. I designed a companion workbook (Tame Your Inner Critic: The Workbook) with space to do the exercises, record your thoughts, doodle and answer some deeper questions not found in the book. I’m glad you found it helpful. 7) In doing this work you recommend, what did you find to be your unique gift and how are you sharing it with the world? The clues to solving the riddle of who-you-really-are and what your unique gift is, reside in the quiet space of joy. Teaching is one of my joys. When the light bulb goes on for those that I am teaching, and I see their faces light up as new horizons of learning become apparent, that is joy to me. That is who I am and why I am here. I hope that I’ve done this with my book. Find Tame Your Inner Critic on Amazon.com, or learn more about Della Temple and her work at www.DellaTemple.com. There are many mind-body healing tools available today, but the Dynamind Technique described in Serge Kahili King’s book, Healing for the Millions, gives the reader a self-help tool to use whenever any physical, emotional or mental problems or pain arise. 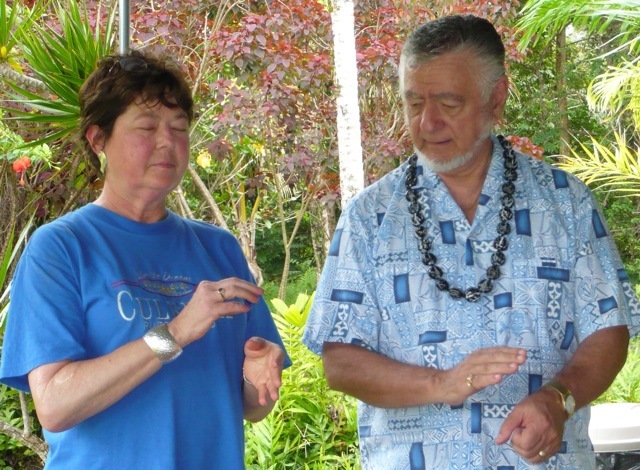 Dr. King fully explains how he developed this system using ancient Hawaiian Huna healing processes in combination with the latest information available on energy healing. Then he takes you step-by-step so you can quickly learn how to put Dynamind into practice. I took a weekend workshop with Dr. King to learn about Dynamind, but the readers of this book will benefit from all the information I was given plus more. This book includes feedback from healers around the world who have been using Dynamind to help teach people to overcome everything from back pain to tinnitus. Serge Kahili King teaching the Dynamind tapping technique. Dr. King’s book is available on Amazon.com as well as on his website, http://www.huna.org.